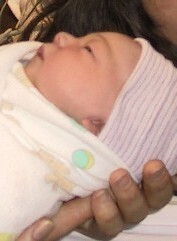 Please welcome my new nephew to the world, as of July 3, 2005, at 11:35 PM Pacific Time! He is my third nephew, but the first child for my brother McKenzie and his wife, Meewon. Mother and baby are doing fine after a 24-hour labor followed by a C-section delivery. I'm deliriously happy. My brother groggily said he'd take a photo and email it to me, but it hasn't come yet - so for now, the news will have to do. I will update with a photo as soon I have one. According to my mother, though, he's adorable. Congratulations on the new tyke. C-section, huh? No surprise your brother's burnt. No doubt the new mother is even moreso. But i'm sure it's gonna be cool. Congratulations! They named the baby after my puppy! Yay!